Mesopotamian Religion, also known as Assyro-Babylonian religion, included a series of belief systems of the early civilizations of the Euphrates valley. The development of the religion of this region was not only important in the history of the people who practiced it, but also strongly influenced the semitic peoples from who the Hebrew religious tradition evolved. Moreover, many of the older Mesopotamian religious ideas worked their way west into the Greek and Roman culture as well. Mesopotamian religion left a profound mark on human civilization. Both the Judeo-Christian and Graeco-Roman tradition have inherited much from the religion of the "Land between the Rivers." The oldest period was from c. 3500 B.C.E. to the time of Hammurabi (c. 1700 B.C.E.). During this period, few historical records have been preserved. The deities later known as the Anunnaki may have been worshiped individually in various population centers. As major centers came to dominate the region, their deities came to be more universally recognized and to assimilate the characteristics of some of the lesser gods. Several major deities arose, such as Innana/Ishtar, Anu, Enki, Enlil, and others. The great city of Uruk emerged as a major religious center. Other centers included Nippur, Ur, Sippar, Eridu, and Agade. The greatest religious-literary event of the era was the creation of the Epic of Gilgamesh, the world's oldest surviving epic poem. The post-Hammurabic period in Babylonia ranged between 1700-1365 B.C.E. Hammurabi united the Euphratean states, and the god Marduk began to emerge as the supreme deity, though by no means the only god. His heroic rise to power and recognition as the king of the gods is dramatically portrayed in the myth known as Enuma Elish. The Assyrian period was between c. 1365 B.C.E. and the destruction of Nineveh in 612 B.C.E. The Mesopotamian pantheon remained little changed during this period, although at times the supreme deity was seen to be Ashur rather than Marduk. Ishtar remained the most important female deity. Astral theology emerges with Marduk or Ashur as the central divinity who assigned the various other gods their respective places in the universe. The neo-Babylonian period began with Nabopolassar (625 B.C.E.-605 B.C.E.) and ended with Cyrus's conquest of Babylon and Babylonia in 539 B.C.E. By the sixth century B.C.E., the gods Anu, Enlil, and Ea(Enki) formed a triad ruling the universe, and a well developed astral theology had emerged, related to today's astrological systems. Marduk remained central, and it was to him that Cyrus dedicated his policy of increased religious freedom, supporting the return of plundered religious items to their respective sanctuaries, and the rebuilding of local or national temples, including the Temple of Jerusalem. Fragment of a bull sculpture from Uruk, c. 3000 B.C.E. As outsiders looking in on an ancient civilization whose diverse religious traditions died out long ago, scholars have struggled to construct a comprehensive picture of Mesopotamian religion without resorting to a great deal of speculation or oversimplification. This problem led one expert in the field, A. Leo Oppenheim, to conclude that a history of Mesopotamian religion "should not be written." For one thing, the sources are relatively scarce, and they are scattered over a wide area and an even wider span of time. What may be a true statement about Mesopotamian religion in one period may thus be misleading when applied to a later time. A god that was a local deity prior to 2,000 B.C.E. may become a major regional god later on, and it is difficult to say with certainty how far a deity's influence was felt until a relatively late period. The study of Mesopotamian religion is also complicated, especially in its early phase, by the fact that similar deities are often given different names in the Sumerian and Akkadian languages. Non-experts have trouble realizing that Inanna and Ishtar, or Enki and Ea, are actually names of just two, not four deities, for example. In addition, over the period of millennia, as the gods evolved from local deities to more universal ones, they sometimes took on the attributes of older gods or of each other. Thus, even the character of the gods often involves considerable speculation. 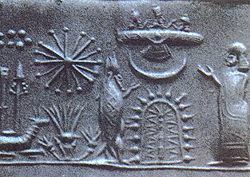 Ancient Sumerian cylinder seal impression depicting the Anunaki. The early deities of Mesopotamia were later referred to as the Anunnaki gods—a group of Sumerian and Akkadian deities related to, and in some cases overlapping with, the Annuna (the "Fifty Great Gods"). The head of the Anunnaki council, in later mythology, was Anu. The Anunnaki were seen as the children of Anu (heaven) and Ki (earth), brother and sister gods, themselves the children of Anshar and Kishar (Skypivot and Earthpivot, the Celestial poles). Anshar and Kishar in turn were the children of Lahm and Lahmu ("the muddy ones"). The parents of Lahm and Lahmu were Apsû (fresh water) and Tiamat (salt water). In the Enuma Elish, Tiamat is the sea goddess, personified as a female sea monster and an embodiment of primordial chaos. She gives birth to the first generation of gods; but she later makes war upon them and is split in two by the storm-god Marduk, who uses her body to form the heavens and the earth. However, the text of Enuma Elish is relatively late. It is difficult to know much about how the Anunnaki may have been conceived of or worshiped in earlier centuries. Moreover, although many early Mesopotamian religious temples and monuments have been discovered, texts and inscriptions are relatively rare. Among the religious texts that have been discovered, three types have been identified: Prayers, rituals, and mythologies. Temples and monuments also describe something of the religious culture and practice, while icons and other art elaborate on religious ritual and mythology. There is evidence that religious temples and rituals played an important part in Mesopotamian life quite early, preceding even the advent of writing. Temples normally occupied the central and highest ground in a settlement. They possessed the town's most sophisticated and high-quality artifacts. Mesopotamia in second millennium B.C.E. Uruk lies to the south. Uruk was one of the oldest and most important cities of ancient Sumer. According to the Sumerian king list, Uruk was founded by Enmerkar, who brought the official kingship with him. In the epic, Enmerkar and the Lord of Aratta, he is also said to have constructed the famous temple called E-anna, dedicated to the worship of Inanna (later called Ishtar). Uruk was also the capital city of the probably historical king Gilgamesh, hero of the famous Epic of Gilgamesh. According to the Bible (Genesis 10:10), Erech (Uruk) was the second city founded by Nimrod in Shinar. The White Temple of Uruk contained several separate shrines within the confines of its walls, which measured 400 by 200 meters. In addition to temples, the stepped-stone towers known as ziggurats were also common. One of these is no doubt the basis for the biblical story of the Tower of Babel. The original seat of the worship of Anu, the Sumerian god of heaven (or sky), may also have been in Uruk. Various other deities were associated with other cities. A sharp distinction can be made between the pre-Hammurabic age and the post-Hammurabic age. Before 1700 B.C.E., there were a number of religious centers in addition to Uruk: Nippur, Kutha (Cuthah), Ur, Sippar, Shirgulla (Lagash), Eridu, and Agade. Each tended to honor a specific god, which was looked upon as the chief deity, around whom were gathered a number of minor deities and with whom there was invariably associated a female consort. 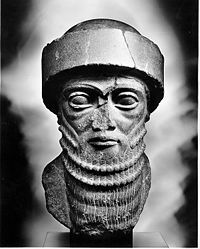 The period around 1700 B.C.E., when Hammurabi effected the union of the Euphratean states, marks the beginning of a new epoch in the religion of the Euphrates valley. In the post-Hammurabic period, the pantheon assumed distinct shapes. The deity Marduk began to emerge as the central and supreme deity, though by no means the only god. Paralleling the centralization of political administration, the gods of the chief religious centers, together with those of the minor local shrines, formed a group around Marduk. Despite a decided progress toward a monotheistic conception of divine government of the universe, the recognition of a large number of gods and their consorts by the side of Marduk remained firmly embedded doctrine in the Babylonian religion, as it did in the Assyrian faith. An important variation, however, was that the role of the head of the pantheon in Assyria was held by Ashur rather than Marduk. Earlier, the goddess Inanna (or Ishtar) came to be widely honored, as did male counterparts to the goddess, such as Enlil and Enki. However, under Hammurabi's reign, Marduk—the patron deity of the future capital, Babylon—became the clear head of the Babylonian pantheon. Associated with Marduk was a female consort called Sarpanit, who may have been identified with Ishtar/Inanna in the popular imagination. 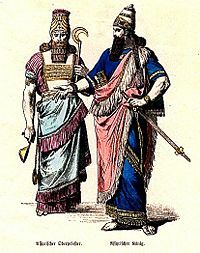 Grouped around this pair, as princes around a throne, were the chief deities of the older religious centers: Ea and Damkina of Eridu; Nabu and Tashmit of Borsippa; Nergal and Allatu of Kutha; Shamash of Sippar; Sin and Ningal of Ur, as well as other deities whose locations are unknown. In this process of accommodating ancient prerogatives to new conditions, the attributes belonging specifically to the older gods were transferred to Marduk, who thus became an eclectic and many-faceted power, taking on the traits of Enlil (wind, rain, fertility), Enki/Ea (intelligence, water), Shamash (the sun), Nergal (underworld), Adad (storm), and Sin (the moon). 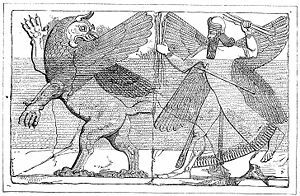 The epic mythology contained in the text of Enuma Elish describes the legendary version of Marduk's rise to power over the older gods. Scholars theorize that the older incantations originally associated with Ea, were re-edited so as to give to Marduk the supreme power over demons, witches, and sorcerers. Hymns and lamentations composed for the cult of Enlil, Shamash, and Adad were transformed into paeans and appeals to Marduk. Meanwhile, the ancient myths arising in the various religious and political centers underwent a similar process of adaptation to changed conditions. Besides the chief deities and their consorts, various minor ones, representing patron gods of less important localities were added at one time or another to the court of Marduk. Thus the Enuma Elish closes with a list of the myriad divine titles by which Marduk would be known after his great victory. However, some lesser deities still retained their independence. For example, Anu was still the god of the high heavens, and Ishtar still symbolized fertility and vitality in general. A "feather robed archer" figure, identified as a symbol of Ashur. Originally the patron god of the city which bore his name, Ashur came to hold the same position in the north that Marduk occupied in the south. The religious predominance of the great city of Babylon served to gain recognition for Marduk even on the part of the Assyrian rulers. Even when they became predominate, they appointed their sons or brothers governors of Babylonia, and in the long array of titles that the kings gave themselves, a special phrase was set aside to indicate their mastery over Babylonia. To "take the hand of Bel-Marduk" was an essential ritual preliminary to exercising authority in the Euphrates valley. Marduk and Ashur became rivals only when Babylonia came to give the Assyrians trouble. In 689 B.C.E., the Assyrian king Sennacherib, whose patience had been exhausted by the difficulties encountered in maintaining peace in the south, besieged and destroyed the city of Babylon. He brought the city's statue of Marduk to Nineveh, to symbolize the god's subordination. His grandson, Assur-bani-pal, with a view of reestablishing amicable relations, restored the statue to its place in Babylon and performed the time-honored ceremony of "taking the hand of Bel" to demonstrate his homage to the ancient head of the Babylonian pantheon. Other than the substitution of Ashur for Marduk, the Assyrian pantheon was basically the same as that in the south, though some of the gods were endowed with attributes which differ slightly from their southern counterparts. The war-like nature of the Assyrians was reflected in their conceptions of the gods, who stood by the side of the great protector Ashur. The cult and ritual in the north likewise followed the models set up in the south. Hymns composed for the temples of Babylonia were transferred to Assur, Calah, Harran, Arbela, and Nineveh in the north. Myths and legends also found their way to Assyria in modified form. To all practical purposes, however, the religion of Assyria was very similar with that practiced in the south. 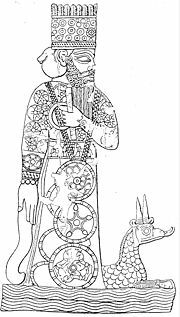 Much like El in Canaan, Anu remained more or less a distant deity during the various periods of the Babylonian-Assyrian religion. By the sixth century B.C.E., Anu's position as the chief god found expression in his portrayal as the first figure of a triad consisting of Anu, Enlil and Ea (also called Enki), who reigned over the heavens, the earth, and the watery expanse, respectively. The mother goddess, Ishtar, remained a powerful presence in her own right, often associated with male deities as their consort or as a fierce warrior and protector. She was frequently associated with Marduk, and still more closely with the chief god of Assyria, Ashur, who occupied in Northern Mesopotamia a position similar to that of Marduk in the south. By the side of the first triad, consisting of Anu, Enlil, and Ea, was sometimes found a second triad composed of Shamash, Sin, and Ishtar. As the first triad symbolized the three divisions of the universe—the heavens, earth, and the watery element—so the second represented the three great forces of nature: The sun, the moon, and the life-giving power. In addition, at times Ishtar also appears in hymns and myths as the general personification of nature and fertility. A seventh great Sumerian deity, the mother goddess Ninhursag/Ninmah, seems to have declined in popularity as Ishtar's popularity increased. Astral theology served as the theoretical substratum of the Babylonian religion, and was equally pronounced in the religious system of Assyria. The essential feature of this astral theology is the assumption of a close link between the movements going on in the heavens and occurrences on earth. This led to identifying the gods and goddesses with heavenly bodies and to assigning the seats of all the deities in the heavens. 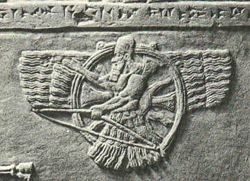 Marduk, the supreme deity, was portrayed as the one who set the celestial bodies in their places and ruled over them all. The personification of the two great luminaries—the sun and the moon (Shamash and Sin)—was the first step in the unfolding of this system. This process led to identifying the planet Venus with Ishtar, Jupiter with Marduk, Mars with Nergal, Mercury with Nabu, and Saturn with Ninurta. To read the signs of the heavens was to understand the meaning of occurrences on earth. With this accomplished, it was also possible to foretell what events were portended by the position and relationship to one another of sun, moon, planets, and certain stars. 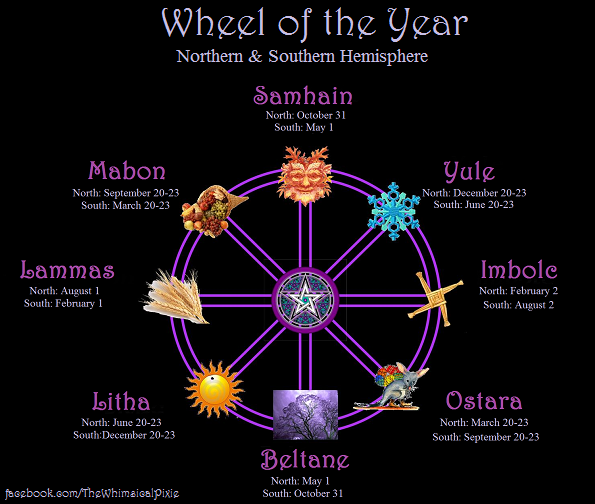 Myths that symbolized changes in season or occurrences in nature were projected on the heavens, which were mapped out to correspond to the divisions of the earth. All the gods, great and small, had their places assigned to them in the heavens. Facts, including political history, were interpreted in terms of astral theology. Worship, originally an expression of animistic beliefs, took on the character of an "astral" interpretation of occurrences and doctrines. This left its trace in incantations, omens, and hymns. It also gave birth to astronomy, which was assiduously cultivated because a knowledge of the heavens was the very foundation of the system of belief unfolded by the priests of Babylonia and Assyria. As an illustration of the manner in which the doctrines of the religion conformed with all-pervading astral theory can be seen in the development of the concept of the three gods Anu, Enlil and Ea. Anu became the power presiding over the heavens. Enlil ruled the earth and the atmosphere immediately above it, while Ea ruled over the deep. With the transfer of all the gods to the heavens, and under the influence of the doctrine of the correspondence between the heavens and the earth, Anu, Enlil and Ea became the three "ways" of the divine realm. The "ways" appear in this instance to have been the designation of the ecliptic circle, which was divided into three sections or zones—a northern, a middle and a southern zone, Anu being assigned to the first, Enlil to the second, and Ea to the third zone. 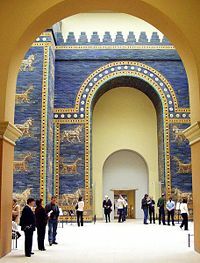 The reconstructed Ishtar Gate, originally located in Babylon and constructed during the reign of Nebuchadnezzar II, currently in the Pergamon Museum in Berlin. The most noteworthy outcome of this system in the realm of religious practice was the growth of a sophisticated method of divining the future by the observation of the phenomena in the heavens. In the royal collection of cuneiform literature—made by King Assur-bani-pal of Assyria (668-626 B.C.E.) and deposited in his palace at Nineveh—the omen collections connected with the astral theology of Babylonia and Assyria form the largest class. There are also indications that the extensive texts dealing with divination through the liver of sacrificial animals, based as it is on the primitive view which regarded the liver as the seat of life and of the soul, were brought into connection with astral divination. Less influenced by the astral-theological system are the older incantation texts. These included formulae and prayers produced in different religious centers and updated to conform to the tendency to centralize the worship of Marduk and his female counterpart in the south and Ashur and Ishtar in the north. Incantations originally addressed to Ea as the god of the watery element and to Nusku as the god of fire, were likewise transferred to Marduk. This was done by making Ea confer on Marduk as his son, the powers of the father, and by making Nusku, a messenger between Ea and Marduk. Ritual was a chief factor in the celebration of festival days and is relatively free from traces of the astral theology. The more or less elaborate ceremonies prescribed for the occasions when the gods were approached are directly connected with the popular elements of the religion. Animal sacrifice, libations, ritual purification, sprinkling of water, and symbolical rites of all kinds, accompanied by short prayers, represent a religious practice which is older than any theology and survives the changes which the theoretical substratum of the religion undergoes. References in the Epic of Gilgamesh and elsewhere to the priestesses of Ishtar as sacred prostitutes indicate the tradition of hieros gamos, in which the king or other representatives of the male principle would engage in sexual acts with the priestesses as representatives of Ishtar in a tradition designed to propitiate the fertility of crops, livestock, and human beings. On the ethical side, the religion of Babylonia more particularly, and to a less extent that of Assyria, advances to noticeable conceptions of the qualities associated with the gods and goddesses and of the duties imposed on man. Shamash, the sun-god, was invested with justice as his chief trait. Marduk is portrayed as full of mercy and kindness. Ea is the protector of mankind. The gods, to be sure, are easily aroused to anger. No sharp distinction is made—as in Israelite prophetic religion—between moral offenses and ritualistic oversight or neglect. However, the stress laid on the need of being clean and pure in the sight of the higher powers, the inculcation of a proper aspect of humility, and above all the need of confessing one's guilt and sins without any reserve. Regarding life after death, throughout Babylonian-Assyrian history, the conception prevailed of a large dark cavern below the earth, not far from the Apsu—the fresh water abyss encircling and flowing underneath the earth—in which all the dead were gathered and where they led a miserable existence of inactivity, amid gloom and dust. Occasionally a favored individual was permitted to escape from this general fate and placed in a pleasant island. The influence exerted by the Babylonian-Assyrian religion was particularly profound on the Semites, while the astral theology affected the ancient world in general, including the Greeks and Romans. Scholars can easily trace such sublime pagan deities as Venus to Ishtar, Jupiter to Marduk, etc. The Israelite and Jewish religion itself was strongly influenced by the remarkable civilization unfolded in the Euphrates valley. In many of the traditions embodied in the Old Testament, traces of direct borrowing from Babylonia may be discerned: For example, the story of Noah's flood (Epic of Gilgamesh) and the creation account of the early verses of Genesis (Enuma Elish). Indirect influences have been noticed in the domain of the prophetical books and the Psalms. The Babylonian influence on so-called "Wisdom Literature" has also been much discussed. 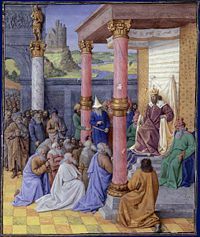 During the Babylonian Exile of the Jews, it would be to Marduk that Cyrus the Great attributed his policy of allowing the Jewish and other captive priests to return to their capitals and refurbish the sacred temples of their formerly deposed deities. Even in the New Testament period, Babylonian-Assyrian influences may be present. In such a movements as early Christian gnosticism, Babylonian elements—modified, to be sure, and transformed—are present. The growth of apocalyptic literature, both Jewish and Christian seems to be influenced to some degree at least by the astral-theology of Babylonia and Assyria. ↑ A. Leo Oppenheim, Ancient Mesopotamia: Portrait of a Dead Civilization (University of Chicago Press, 1974), p. 171. Beaulieu, Paul-Alain. The Pantheon of Uruk During the Neo-Babylonian Period. Leiden: Brill, 2003. ISBN 9789004130241. Gordon, Cyrus, and Gary Rendsburg. The Bible and the Ancient Near East, 3rd Edition. New York: W.W. Norton and Company, Inc., 1998. ISBN 978-093316896. Holloway, Steven W. "Aššur Is King! Aššur Is King! Religion in the Exercise of Power in the Neo-Assyrian Empire." In Culture and History of the Ancient Near East. Leiden: Brill, 2002. ISBN 9781417590926. Jacobsen, Thorkild. The Treasures of Darkness: A History of Mesopotamian Religion. New Haven: Yale University Press, 1976. ISBN 9780300018448. Linssen, Marc J.H. The Cults of Uruk and Babylon: The Temple Ritual Texts As Evidence for Hellenistic Cult Practices. Leiden: Brill, Styx, 2004. ISBN 9789004124028. Oppenheim, A. Leo, and Erica Reiner. Ancient Mesopotamia: Portrait of a Dead Civilization. Chicago: University of Chicago Press, 1977. ISBN 9780226631875. Rochberg, Francesca. The Heavenly Writing: Divination, Horoscopy, and Astronomy in Mesopotamian Culture. Cambridge: Cambridge University Press, 2004. ISBN 9780521830102.